Why are we afraid of asking questions that matter? We’re bloody complicated people. Hah! No kidding! No seriously, we are. We go about our lives in such dramatic fashion, but we long for a life without drama. Peace and serenity and quiet with all the money, the luxuries, the material comforts sounds really like a must-have no? What BS! We’d be tearing our hair out, dying to throw caution to the winds and just give peace and all that jazz the royal slip. Who wants to be a peacenik?! Hrmph! Let me park all of the above for a moment and get to the crux. We spend so much of our time hiding from answers to questions that we don’t even know how to question any more. 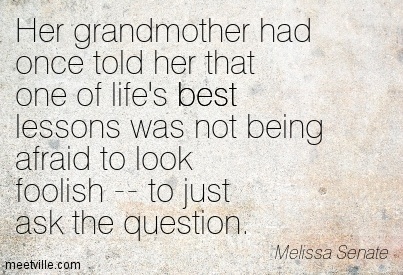 I had a grandmother. In fact even two great grandmothers. They never told me to cut the crap and just ask the question. I never learnt therefore to get to the crux of the matter. I always brooded, glossed over, pretended. But I was always afraid to say something because it might make me look, sound, seem foolish. I’ve been in love so often when I was younger, and I was always afraid to ask, “do you love me?” and my fears came true. They never did. It was like a self-fulfilling prophecy. But that’s what we do. We live our entire lives disconnected from our true selves. Now in the age of smartphones, the disconnectedness is even more. Each of us lives in dysfunctional families, societies, states and countries. We see what’s wrong, we’re dying to ask why, yet we keep mum. When someone asks, “how are you?”, why do we mouth “I’m fine” on autopilot, when actually you’re burning with anger, pain, grief, disillusionment or what have you? It’s the same with everything and anything else. Do I write well? Will I ever write a book? Can I ever muster enough resolve to get rid of my insecurities? Will I ever be famous? Questions that are always chasing answers, provided asked. Who are we kidding? Why are we afraid of the truth? I thought about it when I heard this show this morning, which strangely was about fear. Take a listen. And then think about it really deep and hard. I’ve been thinking about this for a long time and more sharply in focus due to this show. What do we really want? When you think about you 20 years down, how’d you like to think about the 20 years you’ve spent getting there? What kind of road did you travel on? Did you take detours? Did you take the fork in the road? We’re always assailed by questions. One big question for me right now is “What do I really want?” What’s yours? Now I’m an adult, a grown woman. And when I sit down to think of what I want, sometimes I don’t really know. When I read all our new-age spiritual enlightened teachers and masters, they all seem to be telling me, “find your passion, find your purpose”. I’ve been trying really hard and I know I don’t know. I also know that I don’t know if I’ll ever know. And then I look back at the tapestry of my childhood to see if I can find the answers in its warp and weft. I find the rewind button to find lazy afternoons spent climbing trees, taking out berries and eating them and delightedly squealing and crinkling up one’s eyes at their sourness. Or secretly slurping at the ice candy being peddled by the vendor on his tricycle and wondering if my grandmom would be angry if I told her I wanted it real bad. I didn’t get to slurp because “they were not good for health and you’ll have worms in your poo poo and fall ill”. I remember playing with the thin twig-like metal leftovers of sparklers after Diwali celebrations, bending them at right-angles and playing some silly game with it, some kind of roll-the-pin thing. I remember lying down on the wall of my verandah which was not more than 6 inches in width and lazily looking at the world passing me by. We lived on the ground floor of an apartment. My young, baby body clothed in a white petticoat or camisole, lying supine on that verandah or sitting under the overhanging arch of the porch, calling out to friends living across in the apartment opposite, having an entire dialogue about school, homework, setting the agenda for the evening and what not. I must not have been more than 5 or 6 then. Yes, there’s a lot I do remember. But I don’t know if I ever knew what I was looking for. Was it the need to get approvals from my grandparents and aunts by getting good grades in school and thus getting their attention? Was it about this desperation to be ‘liked’ despite being dark skinned, by the boys of the neighbourhood? Or did I just want my parents to be around when I was growing up? To run to them and show off my report card? To have birthday parties and be kissed and smothered as if I was the ‘apple of my eyes’? Maybe to wear a new dress and speed off to strut my stuff and have everyone exclaiming, ‘you’re the cutest, you look like a doll’? Maybe it was prattling to ‘daddy’ about my day and whatever little girls talk to their fathers about? Maybe I was just seeking a safe, loving haven that would protect me from the big bad world outside? I don’t really know honestly.Was it this increasing need, a heartfelt desire that throbbed in rhythmic tempo to my heartbeat and seemed to pick up tempo as I grew up, to feel accepted by friends? For, despite having them around to play ‘house-house’, ‘hide and seek’, ‘hop scotch’ , ‘skipping’, ‘seven tiles’ ‘Simon says’, ‘land and water’, ‘marbles’ and other ethnic (perhaps as I don’t know their English variations or names) games with and share gossip with, I think deep down I always felt that I was treated like an ‘outsider’, and not part of the sacred ‘inner circle’. I always heard giggles behind my back and automatically assumed that they were laughing at me. After all I was plump, ‘intelligent and a first ranker’ (which was actually a not-very-nice-to-have-label as it weighed you down by its sheer expectation), supposedly rich (as my parents were away toiling in the Gulf and what my mother put up with out there requires a novella to do it justice) and of course dark skinned, a ‘black bull’ if you will. Yup, for sure I was the ‘outsider’ or so my nubile young mind told me. The sublime art of making meaning out of nothing, everything and something had taken root. It was the beginning of the Age of the Meaning Making Monster. Hallelujah! As adolescence embraced me, I didn’t have ‘date nights’ and I didn’t have ‘best girl friends’ night out pajama parties’. I don’t remember my teen years much. Everything seems to be a blur. Maybe it’s a deliberate act that allows me to feel safe in the absence of abiding and happy memories. No, I don’t remember what I was looking for. Or perhaps it was the craving to have that one, just that one mate with whom I could share everything, my anger, my fears, my insecurities, my needs, my little dreams, my tears, my everything, without being judged? I don’t know. I do know that I have been a seeker forever (it seems). Seeking to belong. Seeking approvals of the person I was and I am now. Finding the elusive acknowledgement of the ‘good’ person I am. Somehow, hoping that I am worthy. That I am good enough. That somehow more than I, me and myself, friends, family and lovers will acknowledge me and somehow by that very act, elevate the seeker in me to a joyous person, a ‘worthy’ person. Because I think all I was and am seeking is to be loved. I am loved, I know. I just find it hard to believe sometimes. I wish I knew why! am I really going to be a seeker forever? am I really always going to want to live by other’s ‘code of expectation’? am I really never going to understand that all I need to do, be,live and find joy is to aspire to be the best version of myself? Yes! I have fears. They’re mine. I wonder if I’ll forever be singing this tune and would it be such a bad thing if I were? Does it matter? I don’t know. Really. Questions roll out at the speed of Whatsapp messages being shared around the world! Hah! And answers? Well, whaddya know! Am the eternal Fool, foolishly looking for something without, when all I have to do is peep within. So what are yours? What do you do to alleviate them? Conquer them? Soothe them? Tell me, so I can learn. Sharing is caring.